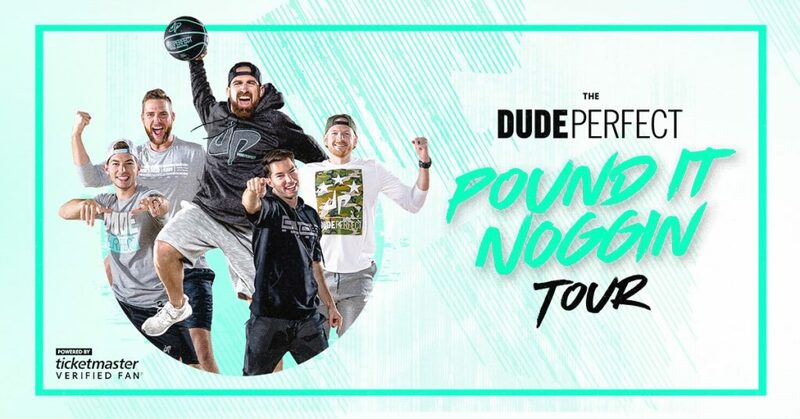 ANNOUNCE FIRST EVER LIVE TOUR ACROSS U.S.
LOS ANGELES (Apr 5, 2019) – Today one of the biggest personalities on YouTube, Dude Perfect, announced their first ever live tour with a stop at the “Fabulous” Forum in Inglewood, California on Sunday, July 14th. Tickets go on sale to the general public beginning Friday, April 12th at 10:00am local time at DudePerfect.com. Tyler Toney, Cody Jones, Garrett Hilbert, and twins Coby and Cory Cotton will take their ultimate variety show across the U.S. this summer. The five best friends from Frisco, Texas have over 70 million social media followers and will be giving fans a look into the fun world of Dude Perfect, highlighting—live and in person—fan favorites such as Overtime, Stereotypes, Battles and stunts. Some lucky fans will even have the chance to participate with the dudes in their crazy antics! The 20-city tour will kick off July 11th in San Diego, CA and make stops in Inglewood, Denver, Chicago, Atlanta and more before wrapping August 11th in Dallas, TX. Full itinerary below. To ensure tickets get in to the hands of fans and not scalpers or bots, the tour has partnered with Ticketmaster’s Verified Fan platform. Fans can register now through Monday, April 8th at 10:00pm ET time HERE for the Verified Fan presale. Registered fans who receive a code will have access to purchase tickets before the general public from Wednesday, April 10th at 10:00am local time through Thursday, April 11th at 10:00pm local time.